I recently collected some aerial imagery at the Asola Bhatti Wildlife Sanctuary in Delhi in collaboration with the people who run the outreach centre. I've really been enjoying working with the data, and this project has helped me clarify the various processes I use while using drones. So far, I have a three page checklist and am maintaining a mission log-book as well; keeping all the documentation up to date is hard! In this post, I'll be detailing the various applications I'm using to control the UAV and process the aerial imagery+data it generates, and will then describe a couple of the outputs. TL;DR: Come for the aerial footage and the 3D models; stay for the process walk-through. I'm using a DJI Phantom 3 Advanced; the P3A can be manually flown using the controller like a regular R/C plane. To tap into its more advanced functions, fly safely and troubleshoot issues though, it needs to be connected to a smartphone. I use the DJI Go app on a OnePlus3 (Android) for regular flights, but may switch to an iPad soon; DJI-related apps apparently work better on iOS than on Android. For mapping missions, there are a number of steps involved. 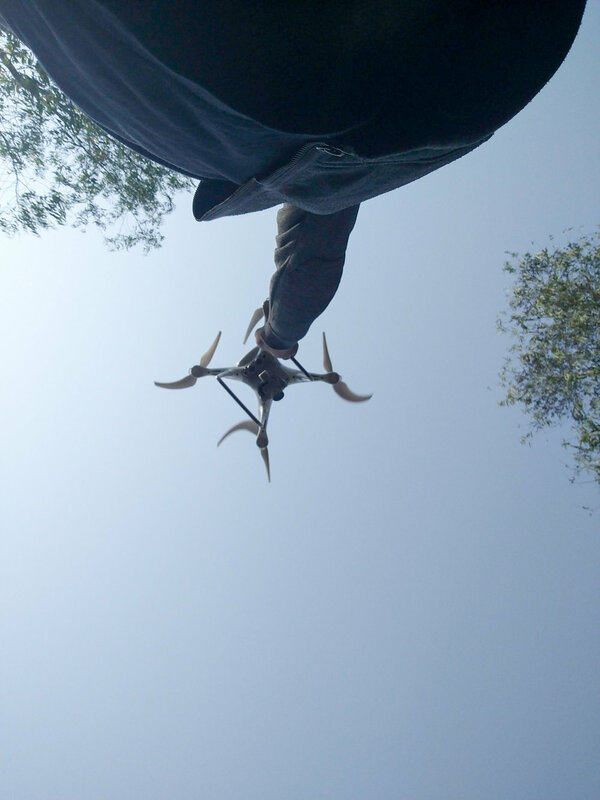 The drone must fly a preset pattern autonomously, collecting images at regular intervals. These images can then be processed into a georeferenced mosaic and used to generate a 3D model. Depending on the use case, these can either be used as-is for visualisation, or analysed further to obtain specific outputs. So far, I've worked with all five of these products; there are more advanced ones available in PrecisionMapper, but I prefer to work directly with these products. I use QGIS and ArcGIS for almost all my satellite imagery analysis work, and these products feed directly into that workflow. The primary output I can create are basic maps; I've never had access to such high-resolution imagery before, so just the simple act of putting a scale bar onto one of these maps is exciting. The images above are true-colour RGB composites, where the red, green and blue layers have been combined to represent the terrain as a human with unimpaired vision would observe it. The thing with composite bands is that they can also be combined to extract information that it's hard for a human observer to see. In a follow-up (more technical) post, I'll discuss the differences between false-NDVI, SAVI, VARI and TGI, which are all indices that use the RGB layers in interesting ways. In this post though, I'm just going to put in two images that depict the Triangular Greenness Index (TGI), which enhances chlorophyll-containing pixels; the greener the pixel, the more likely it is to contain vegetation. 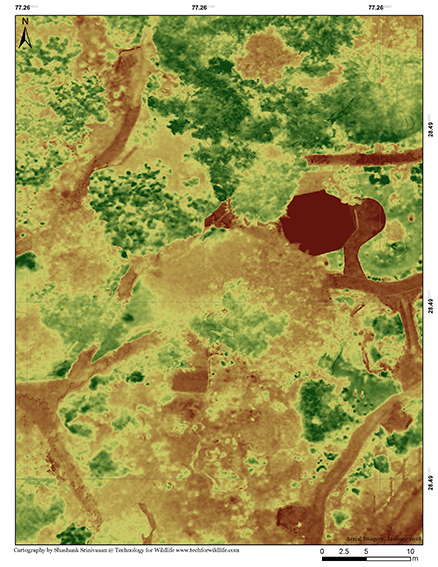 There are various other algorithms that can be applied to the orthomosaic imagery; PrecisionMapper itself offers a couple that can delineate individual trees or count plants in rows. I'm going to be studying up on what else can be done with this imagery, especially with supervised classification and AI-based analysis processes. And finally, my favourite output: the 3D model! With enough images from multiple perspectives, modern photogrammetry algorithms can generate vertices and meshes that depict an object or a landscape to scale and in three dimensions. I'm excited about these because while it's really cool to see these embedded in a web-page (as above), it's even cooler to see them carved out in wood or 3D-printed in ABS plastic. It's even possible to pull this into a VR system and explore the terrain in person, or make it the basis of an interactive game or... you get the drift; this is exciting stuff! Get in touch via our contact form if you have any questions or want to discuss a project of your own. Drones, aerial imagery, 3D models and VR. I've been working a lot with drones and aerial imagery recently, and have been really enjoying myself. I'll be writing about a specific project I'm currently undertaking in another blog post, which will include pictures and 3D models. In this post, however, I wanted to jot down a few of the things that are possible with a cheap source of high-quality aerial imagery. 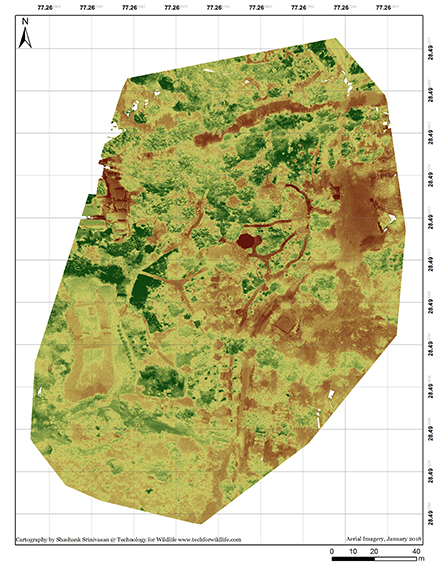 There are applications that satellite imagery isn't suitable for; mapping small areas at a very high resolution, at a chosen time, is a task that drones are far better suited to. *** When I first started using drones, this was what I first thought of drones as: another source of aerial imagery with both advantages and disadvantages. However, prolonged use, lots of reading and lots of tinkering with various photogrammetry software packages has also made me aware of how much more than that they can be. Drones aren't just flying toys; they're robots. They can be programmed to fly specific patterns while collecting data at specific points. In the case of imagery, which is the application I'm limiting this post to, mobile-based software tools such as DroneDeploy and Pix4Dcapture can make a drone collect imagery automatically over a large area. With a large number of images covering the same area, it's possible to create a very accurate 3D model with 1cm/pixel resolution or better. For me, this is truly where it gets interesting. With this 3D model, it's possible to undertake formerly-laborious tasks, such as quantifying the biomass in a stand of trees, very easily; 3D models are great for volumetric analysis. It's also possible to use a 3D printer or CNC router to create a physical model, which would make a great art piece or communication tool. Finally, it's possible to use the 3D model as a basemap for a virtual reality experience set within the landscape. In combination with data on the local biodiversity, this could result in amazing products for conservation outreach and research. *One of the reasons that led me into spatial analysis was that Landsat data became free to use in 2007, right when I was first learning how to use GIS. ** Another issue with satellite imagery used to be overpass times; no matter how large your budget for satellite imagery was, it was still possible that no satellite was in the right position to collect the imagery you wanted. That's rapidly changing; satellite imagery providers such as Planet state that their goal is to have enough satellites in orbit to image the Earth's entire surface once a day. *** There's a lot of discussion about appropriate nomenclature; do we call them UAVs or drones? My take is that if it's a technical piece where the distinction between robots of various kinds (UAVs, UCAVs, AUVs, ROVs, UGVs) etc is important, then I use the acronyms; if it's just a placeholder for 'flying-robot-without-a-person-inside', I'm going to call it a drone. A first person account of the capture of a tiger in Northern India: Four elephants, a bulldozer and a drone. In February 2017, a tiger killed two people within a span of 3 days near the Pilibhit Tiger Reserve in Indian province of Western Uttar Pradesh, and was declared a man-eater. With state elections around the corner, and local villagers threatening to boycott the polls unless the tiger was removed from the area, the Uttar Pradesh Forest Department (UPFD) began an operation with the objective of capturing or killing the tiger. They also called in a drone team to be a part of the operation, primarily to have a highly visible way of broadcasting to the local communities that something was being done to catch the tiger. Ayush Gupta teaching a Forest Department staff member how to fly a UAV. 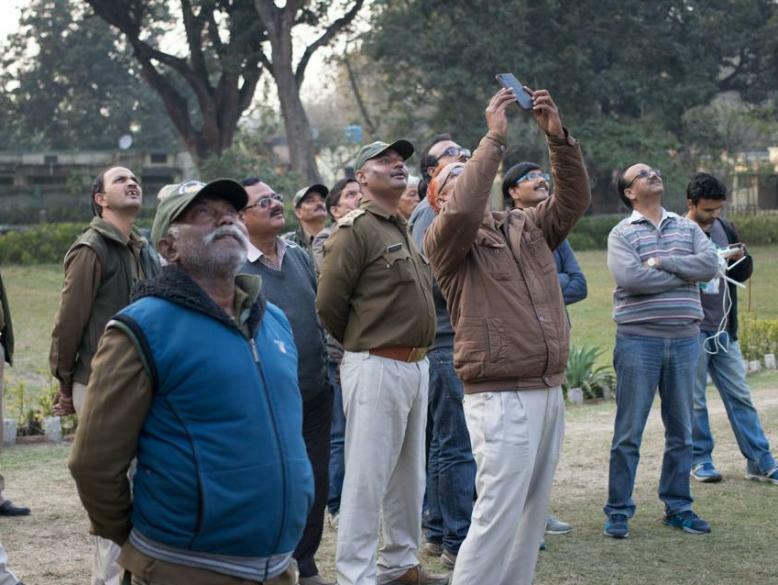 Forest Department staff watching a drone in flight. 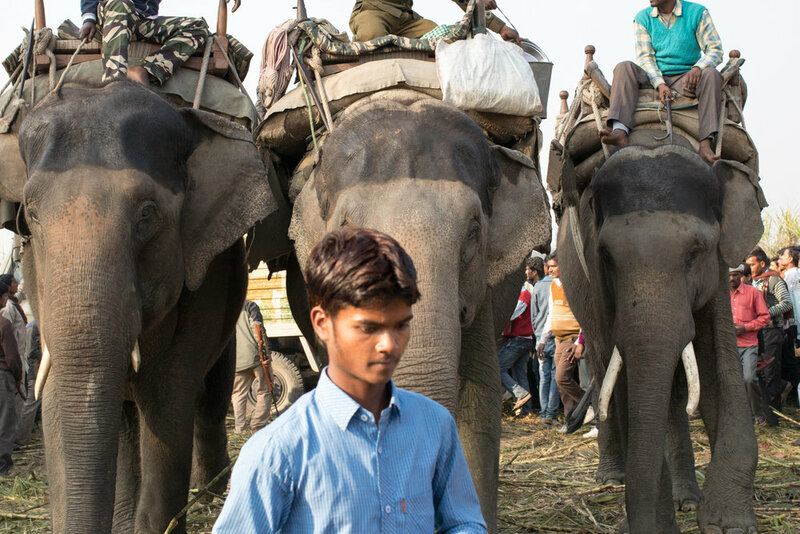 Using a Phantom 4 to distract the crowds, allowing the elephants to conduct the actual search unhindered. Dr. Utkarsh Shukla supervising the perimeter netting from elephant back. The flushing operation, as seen from the DJI Inspire 1. The tiger can be seen within the black circle. The crowd climbed onto the cage and truck after the tiger was captured. A few women watched the action from a safe distance. The Forest Department staff tried pushing the crowd away from the cage. The Forest Department's elephants were kept back from the crowd once it was clear that the tiger could not be harmed by the crowd. 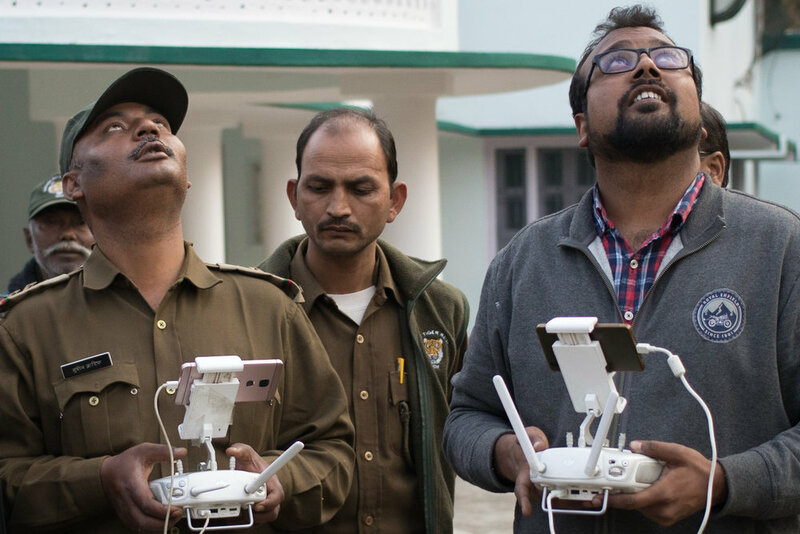 Drones are still a novelty in India; the Directorate General for Civil Aviation banned their use by civilians in October 2014 till further regulations were issued, which haven’t arrived till date. However, there are civilian companies who provide drone services, bypassing the regulatory ban through the use of waivers from the authorities, or by working directly for government agencies as was the case in this operation. I was tasked with coordinating between the drone team and the UPFD, and we arrived in Pilibhit on the afternoon of the 10th of February. The tiger had been located in a sugarcane patch the previous evening, but had managed to give its hunters the slip. On the day we arrived, extensive search operations were on over a large area to locate the general whereabouts of the tiger. While waiting for information, we demonstrated the use of the drones to the UP Forest Department staff. Both were quadcopters, that is, drones with four rotors that are capable of taking off vertically and of hovering in mid-air like helicopters. One was the consumer-level DJI Phantom 4, while the other was the professional-level DJI Inspire - both are equipped with controllable cameras, and are commonly used for videography purposes. It turned out that the Forest Department also had a Phantom 4 of their own, which they’d brought down from Dudhwa Tiger Reserve. Our drone operators used the afternoon to conduct basic training, showing the UP Forest Department staff how to fly their drone safely and use it for surveillance. Tiger capture operations can last anywhere from a few days to a few weeks, and often end inconclusively. So our initial plan was to spend at least three days in the area conducting drone operations. Subsequently, depending on how things played out, and how useful the drones were perceived to be, we’d either head back to Delhi or extend our stay in the area. As it turned out, this tiger really was a man-eater; it made its third kill in 5 days in the early morning of the 11th of February. 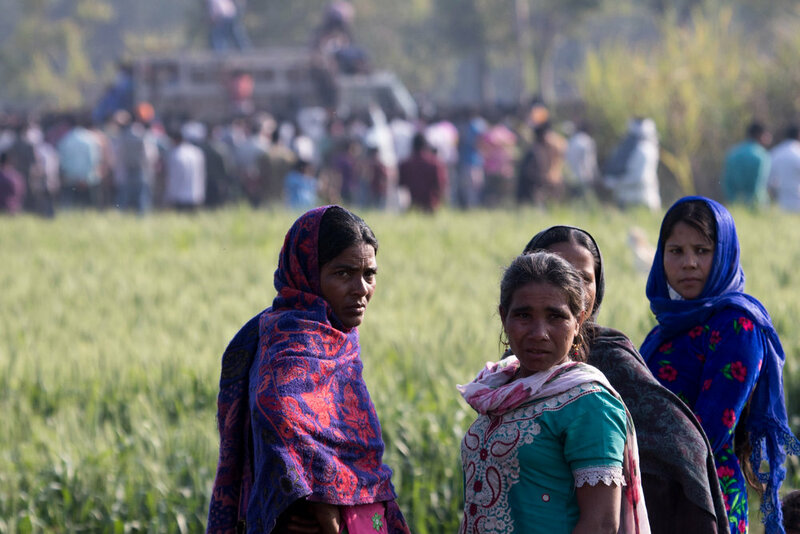 We reached the kill site, in a village to the west of Pilibhit, shortly after we heard the news and saw that a large crowd of people had gathered. One group of people surrounded the Forest Department staff who were interviewing the victim’s brother, while others surrounded local headmen who were giving interviews to the press. 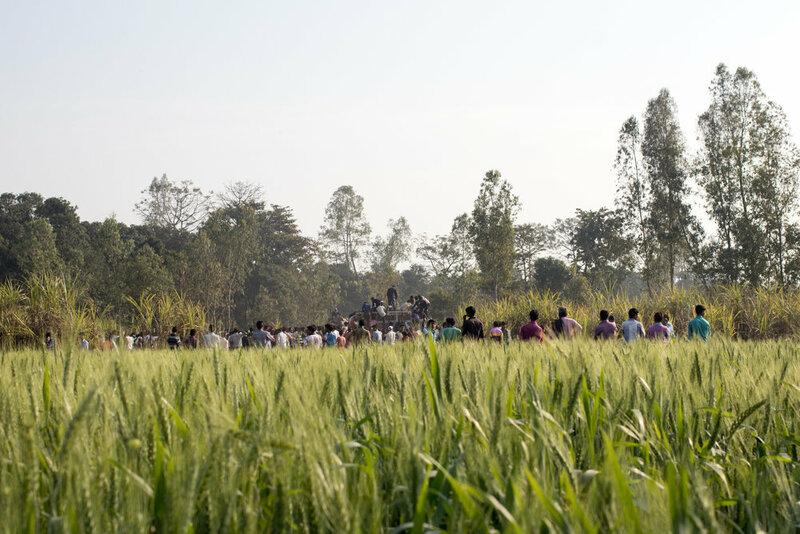 There was also a continuous flow of movement as people went to view the body of the last victim, which lay in a sugarcane patch nearby. On the ground, next to a pile of sand not far from the body, was a clearly defined pugmark. Shortly after we got to the kill site, the Forest Department received information that fresh tiger pugmarks had been found about 2km north of the kill. All the action quickly re-centered itself; two trained Forest Department elephants were summoned and we headed out to that area to join the operation. 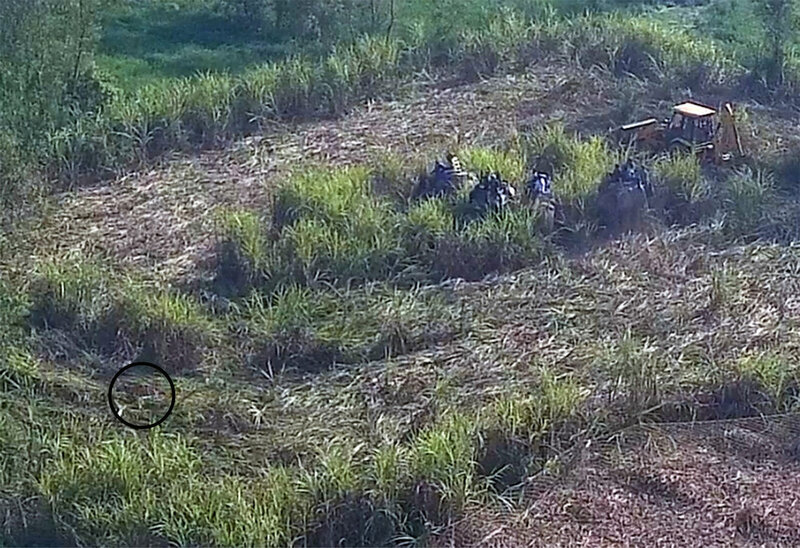 We sent up the Phantom 4 to scan two large sugarcane patches where the tiger could potentially be hiding, with the camera pointing downwards. We weren’t really expecting to see anything through the dense greenery, and we didn’t. However, while there was a chance that we’d actually find something, these flights also served to keep the crowds that had gathered distracted and away from the elephants, which were searching some distance away. Most people in India haven’t seen drones in action; I live in Delhi and work on drone policy issues, but even I’d only seen them used twice in India before this operation. While one does eventually get used to them, there’s something fascinating about watching these small robots take flight, and the local residents who’d come out in droves to watch the tiger being captured weren’t immune. The open-top safari jeep we were operating the drones out of was constantly surrounded by people, and it’s the closest I’ve ever been to feeling like a movie star. Since there were so many people in close proximity, we were launching the Phantom 4 off the hood of the vehicle but landing it by direct hand-capture, which is a very showy manoeuver. We did this for about 20 minutes, and then word came that the elephants had pinpointed the square plot of sugarcane the tiger was actually hiding in. We headed there and kept the drones out of the air till they were called for, watching as the operation unfolded. 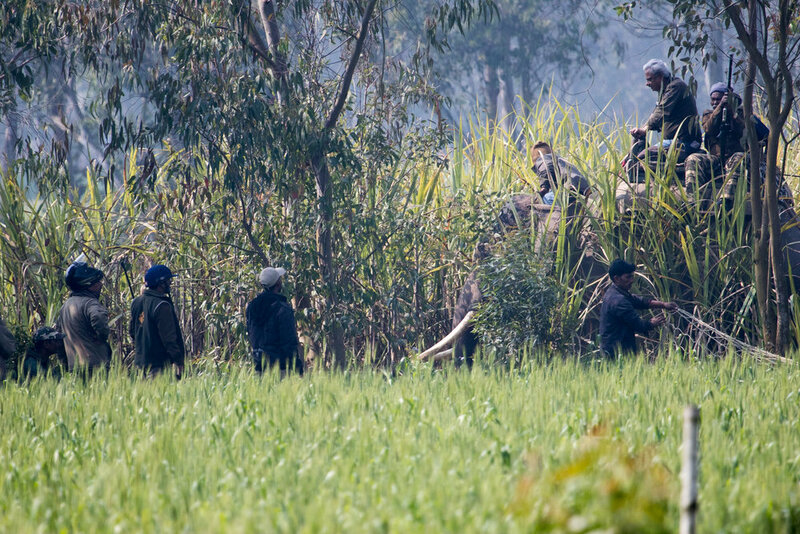 Forest Department staff set up nets around the outer perimeter, guarded by the veterinarians and forest guards armed with tranquilizer, and regular, guns riding on elephant-back within the sugarcane patch itself. Shortly after the nets were put up, there was the sudden trumpeting of an elephant. We heard that the tiger had charged at one of them, and scratched it near its right eye and on its trunk. 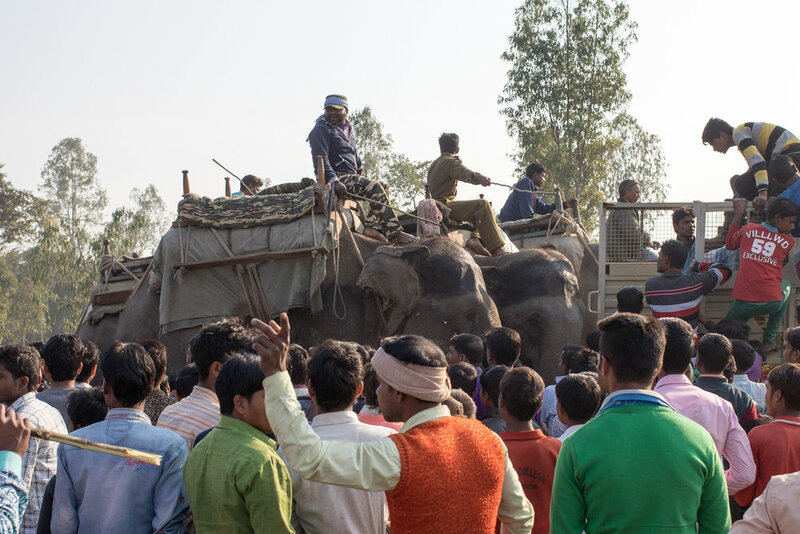 The operation then halted for a while as everyone waited for two more trained elephants, a bulldozer and a truck, carrying a cage, to arrive on site. Once all the resources were in place, the bulldozer began spiraling inwards into the sugarcane patch, gradually removing the tiger’s cover while leaving a thin fence of sugarcane along the perimeter. We sent up the larger drone at this point, both to document the operation and to keep it ready in case the Forest Department staff wanted to try and use it to flush the tiger out of the sugarcane. From our vantage point outside the sugarcane patch, we could see the top of the bulldozer as it slowly mowed down the sugarcane, followed by a view of the elephants, with their riders, moving placidly through the sugarcane patch. It could have been any other calm afternoon, but the peace was suddenly disrupted by a swift burst of confused action. We saw a sudden burst of motion from the elephants, and I heard trumpeting, a roar and two distinct gunshots. However, later review of the video footage from the drone made the sequence of events much clearer. The bulldozer had removed most of the sugarcane, leaving only a small central patch standing, and once it was done, the four elephants took a circuit of the central patch. At the point the action had begun, two of the elephants either sensed the tiger, or their riders spotted it. Either way, both elephants wheeled to the left and charged into the sugarcane patch, and the other two followed. All four flailed around in the sugarcane. A little distance away, there was movement in the underbrush, and then the tiger burst out into the circle cleared by the bulldozer, and then dashed back into cover in the sugarcane left standing along the perimeter. As it turned out, the veterinarians had managed to shoot the tiger with at least one tranquilizer dart. The elephants and their riders were pulled back as everyone waited to make sure that the tranquilizers had taken effect. In the meanwhile, the tiger doubled back into the sugarcane patch and then passed out. Two of the elephants then went back in to the patch, and once the personnel on elephant-back confirmed that the tiger had been incapacitated, they called the truck with the cage in. They dismounted from the elephants, quickly carried the tiger to the truck, pushed it into the cage and locked it. It’s at this point that the surrounding crowds stormed the site and climbed onto the truck, snatched the keys from its hapless driver and slashed its tires. Newspaper reports of the day claim that the ‘angry locals’ also tried to set it on fire, but I didn’t see any evidence of that. Also, while I’m sure that there was anger and resentment on the part of the local communities against the man-eating tiger, the Forest Department and the State Government, I don’t think that the crowd itself was angry. I’ve grown up in Kolkata when it was under Communist rule, and I’ve seen angry mobs on the streets. This, however, seemed to be a crowd composed primarily of young men who were torn between wanting to hurt the tiger, see the tiger or merely be a part of the giant party in progress. The abundance of freshly-bulldozed sugarcane proved to be attractive to the mob - while some of it was being gnawed upon by those on the fringes of the mob, a lot of it was thrown at the truck, at other people or into the air. The elephants with their mahouts were still on the field near the truck, being used to help control the crowd. When one of the airborne sugarcane sticks went very close to one of the elephants, its mahout glared at the section of people from where it had come, and that was the end of the sugarcane throwing. The Forest Department staff behaved admirably; once it was clear that the crowd couldn’t actually get to the tiger within the cage and harm it, they pulled the elephants out to one side, and kept them facing away from the crowd. They’d sent for a tractor to pull the disabled truck with the cage away, and in the meantime let the crowd spend its passion and energy climbing all over the truck and the cage. 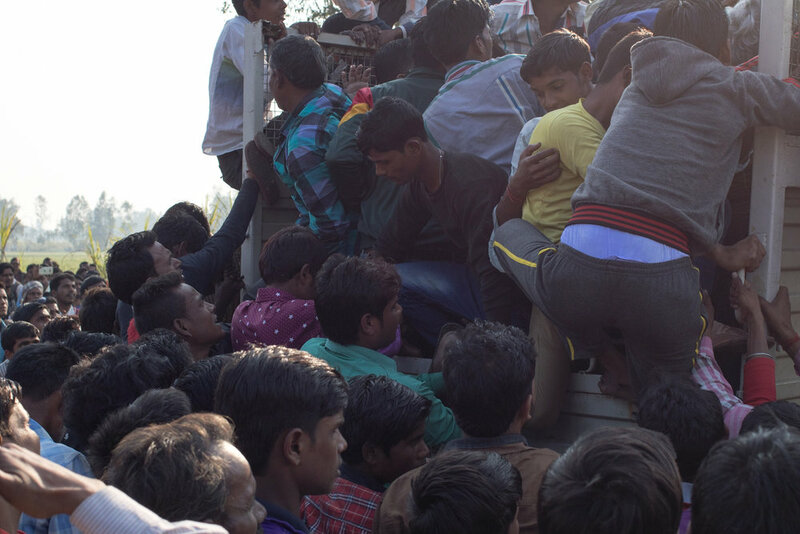 It was only when the tractor arrived that the Forest Department staff, and some police who’d been deputised to help, set up a cordon around the truck and made a real effort to push the people off. The truck was then attached to the tractor by ropes, and towed away with its captive and unconscious inhabitant. The removal of the tiger from the site marked the end of the operation. It was successfully captured alive and sent to the Lucknow zoo. The elephants, their mahouts and the drone operators were thanked for their service, and everyone went on their way. While the drone deployment provided a useful record, and a unique perspective on the events of the day, it was the tried and tested age-old technique of hunting tigers, using beaters (or in this case, a bulldozer) and riders on elephant-back, that resulted in a successful resolution to the story of one of the man-eaters of Pilibhit in 2017. With thanks to Ayush, Shakti, Harshad, Mudit, Naresh and Jaspreet. India needs its roads. Our road network is essential to the free flow of goods and people across the country and connects rural villages to the rest of the nation. India’s roads, together with the railways, make us one. The question that should be asked, however, is how many roads does India need? It is obvious that there is an upper limit to the area that any nation can allocate to its road network. Aside from the fact that building roads is expensive, the opportunity cost must also be considered; the land given over to building a road can now no longer be used for other purposes. There are other factors to consider as well. Building a road requires contiguous stretches of land, and in a country like India where there is a mixture of public and private property, land acquisition has its own financial and political costs. Road building also has long-term ramifications, especially on the environment and ecology. Road construction necessitates the altering of ecosystems; mining of construction materials and the clearing of the road’s planned alignment result in the cutting of trees and the disposal of excavated rock and debris. While ecosystem alteration itself can have persistent impacts, the mere presence of a road also has long-term effects, modifying environmental variables such as the groundwater recharge rate, the local biodiversity, and even the local temperature. They also make previously wild areas more accessible, increasing incidences of poaching and illegal timber felling. And once we factor in traffic movement, the number and severity of impacts only increases. Wild animals using roads are often hit by vehicles, commonly being injured or killed. Over time, entire animal populations may start avoiding roads, restricting their access to food, water, and shelter, and setting them on the path to local extinction. For all the pros of building roads, there are also clear cons. This is true across the world, but is felt especially hard in India, where we face the unique circumstance of having both a highly dense human population, as well as high densities of biodiversity in specific regions. While people need roads, they are also dependent on ecosystem services such as clean air and clean water, which originate from the same wild areas being damaged by roads. This should not be an either-or situation. Indians require both roads and intact ecosystems, and hampering the development or function of one for the sake of the other will not benefit the nation. To maximise the benefits of roads and minimise their impacts, far more time and effort should be spent on determining exactly where roads should be built. A spatial study by Laurance et al (‘A Global Strategy for Road Building’; Nature, 2014) attempts this at the global scale by comparing the potential impacts of roads on the environment against their benefits to agricultural productivity. In India, studies of this sort, taking into account the requirements of the nation, would be extremely valuable, as they enable planners to clearly assess the pros and cons of road construction before any action is taken. In those cases where it is deemed necessary to construct new roads that may have adverse impacts on the environment, decision-makers must follow the mitigation hierarchy. This is ideally a transparent step-wise process whereby the impacts of any given road on the environment are assessed, and efforts are made to prevent or alleviate them. Identifying those impacts that can be avoided or minimised, and then mitigating or compensating for those that cannot, would go a long way toward preserving ecosystem services, while also allowing for road development. Unfortunately, since the political imperative is to build more roads faster, agencies responsible for road construction have little time or effort to allocate toward long-term planning. Recent proposals to build roads through formerly inviolate forested areas or prime wildlife habitat are short-sighted and bring to mind the era of big dams, whose construction resulted in disastrous impacts on human communities and the environment which far outweighed the over-hyped benefits these dams were built to provide. However, politicians believe that the promise of building roads attracts votes, as can be seen from the political discourse at all levels; Members of Legislative Assemblies promise small villages road connections to the nearest towns while Central Government Ministers claim that roads will be constructed at the rate of 40km/day across the entire country. As they also tend to think in the short term, chained to the election cycle as they are, the effectiveness of political advocacy on this matter seems self-limiting. The task thus falls to India’s civil society, India’s judiciary, and to the development banks that fund road projects, to ensure that the costs and benefits of proposed roads are well thought through before implementation. Those government agencies and private agencies responsible for road construction can help by making proposed road alignments available for public debate and discussion. Eliciting constructive feedback from the public — including wildlife and environmental experts — at the planning stage will help prevent delays and the resulting escalations in costs due to legal challenges or protests during the actual construction phase. It is only by wisely planning for the future that we will be able to ensure that India has a world-class road network that takes into account the needs of all its citizens. India is jostling for space in the global marketplace with other rising powers and needs robust energy supply to compete effectively. Implementing new power projects to harness domestic natural resources is one way to achieve this. However, in India, large-scale infrastructure projects have been hard to undertake due to their perceived adverse social and environmental effects. Today, strong internal environmental regulations and an activist civil society have raised the costs of implementing such infrastructure projects within India. In this context, it is not surprising that India is looking to international markets to service its growing energy needs. Experiences from across the globe suggest that firms — whether state-owned or private — will opt to invest in countries where national regulatory frameworks are most conducive to business. India’s decision to support investments in large-scale, low-cost hydropower in Bhutan is a case in point. Bhutan, landlocked and sandwiched between Sikkim and Arunachal Pradesh, has significant potential for hydropower production. Together with an enabling business environment, the absence of an active judiciary and a relatively nascent civil society makes it a seemingly ideal destination for Indian energy investments. What makes India’s energy investments in Bhutan unique, however, is its professed commitment to a set of organising principles now popularly framed as ‘South-South Cooperation’. As a key development assistance provider from the Global South, India believes that its development partnerships with other countries in this grouping must align with the principles of respect for national sovereignty, equality, non-conditionality and mutual benefit. The first hydropower project supported by India (Chukha, 336 MW) was completed in 1988; over 80 per cent of the power it subsequently produced has been exported to India. India’s domestic demand for hydropower has increased dramatically since then, prompting a search for innovative financing tools. India has promised to help Bhutan install power plants that will generate 10,000 MW of hydropower by 2020. In the early years, India provided funding to Bhutan as part-grant, part-concessional loan. However, this model was considered to be unsustainable as it relied solely on public funds from both countries. To address this issue, and to meet its ambitious 2020 target, India has proposed a new ‘Joint-Venture’ (JV) model to raise funds for its hydropower investments in Bhutan. The JV model is a partnership between public sector undertakings of both India and Bhutan, with 70 per cent of finances to be raised as company debt, and 30 per cent to be equity from India. The latter contribution was initially intended to be shared equally by both countries, but upon Bhutan’s refusal to do so, India agreed to pay Bhutan’s 15 per cent share as a gesture of goodwill. There are currently 10 projects in various stages of progress under this model. Another model that has been proposed is the public-private partnership (PPP). The Dagachhu project, a JV between Tata Power, Bhutan’s DGPC, and the National Pension and Provident Fund of Bhutan (NPPF), is Bhutan’s first PPP for hydropower development. Co-financing partners include the Asian Development Bank, Austria’s Raiffeisen Bank and the NPPF, making this a truly multi-stakeholder initiative. This partnership will allow Tata Power Trading Company, an arm of Tata Power, to sell the power generated from the Dagachhu project to the Indian energy market. The PPP model thus offers India a way to support hydropower development in Bhutan without relying solely on its own finances. It is evident that a variety of sophisticated financing modalities, untied to any kind of political conditionality, has allowed India to pay for Bhutan to produce the electricity India needs to service its own economy. In exchange, Bhutan profits from the revenues generated from selling this electricity to India, which, in turn, enables it to offset any unfavourable trade imbalances. It would seem, therefore, that India’s energy partnerships with Bhutan align with the basic principles of South-South Cooperation. On closer scrutiny, however, it seems that the actual implementation of these projects is not always guided by the values of mutual benefit and equality, especially with regard to Bhutan’s environment. Despite Bhutan’s strong environmental and biodiversity protection regime, there have been irregularities regarding environmental impact assessments conducted by Indian agencies, resulting in decisions that are not always environmentally sound. For example, the construction of the Punatsangchhu-I (1,200 MW) and II (1,020 MW) power projects has allegedly jeopardised the habitat of the endangered white-bellied heron. Some hydropower projects supported by India in Bhutan have also had adverse effects within India itself. For example, excessive releases from the Kurichhu (60 MW) project had severely damaged the downstream Manas National Park, a World Heritage Site, in 2004. Anticipating similar levels of destruction resulting from the Mangdechhu (720 MW) power project, which is also upstream of Manas, the World Heritage Committee has twice requested Bhutan for information on the estimated impact of this project. Hydropower is an essential and irreplaceable component of Bhutan’s strategy toward green socio-economic development. However, the judiciary and civil society in both countries should scrutinise the social and environmental impact of these projects, and create appropriate mitigation and accountability measures. As India’s economy grows and its search for resources to fuel this growth continues, its development partnerships will expand in scale and geographical reach. Developing clear regulations that outline India’s strategy towards its investments overseas and institutionalising the principles of South-South Cooperation will be critical to ensuring that relationships with other countries in the Global South remain harmonious.